Take a Dip in the Holy Waters. 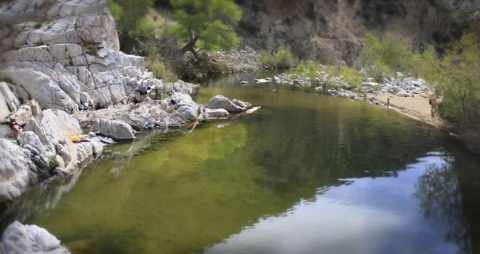 . .
On Friday we carpool to Deep Creek Hot Springs—a sacred desert oasis! This Eden-like natural wonder offers several different warm pools nestled into the banks of a refreshing desert river. There are large, flat rocks for sunbathing and plenty of shady trees for napping.Because of the rugged hike into the springs, very few people know about these healing waters. Note: There is a $6 parking fee per person to go to the hot springs.